September begins with Labor Day, which we mark with commemoration of the social and economic achievements of American workers. Our Boston Social Security Disability Insurance attorneys recognize that a big part of that is the push for implementation of workplace protections to prevent serious work-related illnesses and injuries. It’s a fight that has led to a reasonable reduction of on-duty hours, the requirement of special equipment when dealing with hazardous substances and mandatory standards that must be followed when working from heights or with dangerous equipment. Still, hundreds are killed and thousands injured annually on the job. No. 5 – Leg/knee injuries. 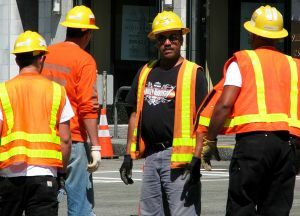 The Bureau of Labor Statistics reported that in 2011, there were 68 workplace fatalities in Massachusetts. Causes included workplace violence to transportation incidents to fires to falls to exposure to harmful substances and contact with dangerous objects or equipment. Thousands more were injured. Some of those were injured so severely that they were unable to report back to work, even within a year of the incident. These individuals would almost unquestionably qualify for Social Security Disability Insurance benefits. The question is whether they should apply. This is a question best-answered by a law firm with experience in handling both SSDI and workers’ compensation claims. You need to know that if you apply for and receive workers’ compensation benefits, it could significantly cut into your SSDI benefits, or visa versa. Fortunately, disability payments from private sources, such as your personal insurance or private pension, won’t affect your SSDI payments. But any public benefits you receive most undoubtedly will. This doesn’t mean you can’t or shouldn’t apply for both, as you may stand to receive more benefits total. But it’s not a decision you should make without careful consideration of what an award of each one will mean for the other. Generally, if you do receive workers’ compensation or some other public disability benefit, plus you get SSDI, the total amount can’t exceed 80 percent of your average current earnings before you became disabled. In Massachusetts, workers’ compensation benefits will equal 60 percent of your gross (pre-tax, pre-benefits) weekly wage. To calculate this, you take the sum of your total gross earnings, including overtime and bonuses, for the past 52 weeks before your injury, and then divide that sum by 52 and then multiply this figure by 0.60. So for example, let’s say you grossed $50,000 the year before your injury. Divided by 52, that’s about 952, multiplied by 0.60, that’s about $577 a week, or about $2,308 a month. You could still apply for SSDI, but you won’t be allowed to collect more than a total of 80 percent of your average current earnings, which would be $761 a week with both benefits combined, or $3,044 total. What that means is if you were granted workers’ compensation benefits in this scenario, your SSDI benefits would be capped at $736 a month. That certainly could make it worth it to apply. If you have questions about how to best approach the process, call us today.